Thousands of fake designer goods destined for sale to Christmas shoppers have been seized during a series of searches at Luton Airport. 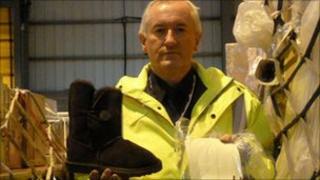 The UK Border Agency said it found eight tonnes of counterfeit items in the run up to the festive season. Among the items are 1,500 fake GHD hair straighteners and hair dryers and about 1,400 pairs of fake Ugg boots. A spokesman said fake electrical products pose a danger as they are unlikely to have had safety checks. Other items discovered include fakes of goods by designer brands Ralph Lauren, Christian Dior, Gucci, Fred Perry, True Religion, Stone Island, Moncler and La Martina. The detections were made on 10 October, 25 November and 1 December but details of the entire haul have only just been released. All items had arrived on freight flights from Turkey and were destined for east London and the east Midlands, the UK Border Agency said. Carolyn Stott, the agency's assistant director at the airport, said: "We often see smugglers adopting quite sophisticated techniques in an attempt to evade detection, but in these three instances there was no subtlety involved. "It was the cost price, however, that showed the goods up for what they were. "The GHD products, for example, were listed as costing just 45 US cents, about 30p." It is up to the companies which create the legitimate products to decide whether to bring a private prosecution against the importer, the UK Border Agency added.